This is an excellent and complete end of the year project for students to work on during those fun-filled last days of the school year. Students complete, color, and decorate 19 reflection pages about the best school year ever! 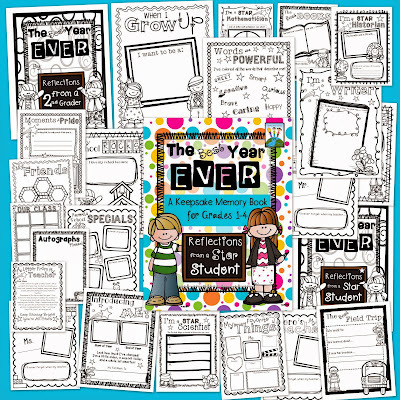 It's perfect to use with multiple grade levels because there are cover pages for 1st graders, 2nd graders, 3rd graders, 4th graders, and even a Star Student Cover! All pages are in black and white for students to complete, color, and make their own! I take a picture of the students during the first week of the school year and again during the last weeks of school to add to the "Introducing Me!" page. When the pages are completed, I add some writing pieces and other saved project work to add to the book. Then I laminate the front and back covers and use the binding machine to bind it into a book.